78” x 78” inside dimensions 6.5’ walls 70” x 24” insulated door (3) 36” Grey glass tinted windows by Deer View (4) 12" Grey glass tinted windows by Deer View 2” of sealed foam insulation 12’ of padded shelving Aluminum extrusion reinforcements Carpeted floor Exterior rain shields Dual built in Air Vent for temperature control - 15 degrees cooler than the competition! Insect and rodent proof construction Custom padded gunrest included 5’ Stand and ladder with ..
(3) 36” Grey glass tinted windows by Deer View Window options - rifle window, bow window, or combo 2” of sealed foam insulation 12’ of padded shelving Aluminum extrusion reinforcements Carpeted floor Exterior rain shields Dual built in Air Vent for temperature control - 15 degrees cooler than the competition! Insect and rodent proof construction Custom padded gunrest included Polyurea coated inside and outside for extreme durability 5’ Stand and ladder with handrail ..
Grey glass tinted windows by Deer View Window options - Combo 2” of sealed foam insulation 12’ of padded shelving Aluminum extrusion reinforcements Carpeted floor Exterior rain shields Dual built in Air Vent for temperature control - 15 degrees cooler than the competition! 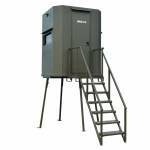 Insect and rodent proof construction Custom padded gunrest included Polyurea coated inside and outside for extreme durability 8’ Stand and ladder with handrail Square tubing construction Diamond ..
A hard-sided ground blind built for the wild! This blind will provide the comfort of an elevated blind, but with a low profile approach. Bow eindoes in the front allow for bowhunting or an easier shot for a youth hunter. Lazyman Green Color 5 Gun Windows, 4 Bow Windows Gun Window Dimensions 13.75" x 8.35", 41" up from floor Bow Window Dimensions 13.75" x 23.35", 24.5" up from floor Door Dimensions 22.5" x 50.5" 78" x 60" x 55" Weight 90 lbs Note: This blind is sold in stor..
Our new Brickhouse blinds are the first of their kind. These new blinds will change the way you hunt from the ground! These models have 9 of our patented injection-molded windows that are built for quiet and ease of use. The base model is painted a flat green color. Lazyman Green Color Gun Window Dimensions 13.75" x 8.35", 41" up from floor Door Dimensions 22.5" x 48.5" 78" x 60" x 55" Weight 90 lbs Note: This blind is sold in store only, and is not shippable. .. The Fatgirl hunting stand is built for comfort and space, it will easily house two people with room to spare. The Fatgirl Bow Blind has 10 of our new patented injection-molded windows that are built for quiet and ease of use. The base model is painted a flat green color. Lazyman Green Color 10 Bow Windows Bow Window Dimensions 13.75" x 23.35", 24.5" up from floor Door Dimensions 22.5" x 55.35" 72" x 72" x 80" Weight 130 lbs Note: This blind is sold in store only, and is not..
A blind built for any hunt. This blind allows the hunter to have multiple options. Youth hunters will benefit from our large bow windows with a lower height for those key moments. Plenty of room to house the whole family for a hunt, or just you and your camera man. Lazyman Green Color 6 Gun Windows, 4 Bow Windows Gun Window Dimensions 13.75" x 8.35", 40" up from floor Bow Window Dimensions 13.75" x 23.35", 24.5" up from floor Door Dimensions 22.5" x 55.35" 72" x 72" x 80" Weigh.. 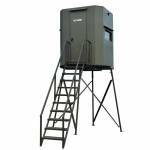 The Fatman hunting stand is for those who like to do it big. Built for comfort and space, it will easily house two or more people with room to spare. It has 10 of our patented injection-molded windows that are built for quiet and ease of use. The base model is painted a flat green color. Lazyman Green Color 10 Gun Windows Gun Window Dimensions 13.75" x 8.35"", 40" up from floor Door Dimensions 22.5" x 55.35" 72" x 84" x 78" Weight 160 lbs Note: This blind is sold in store o..
A blind built for any hunt. 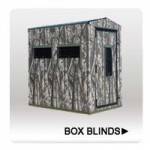 This blind allows the hunter to have multiple options. Youth hunters will benefit from our large bow windows with a lower height for those key moments. Plenty of room to house the whole family for a hunt, or just you and your camera man. Lazyman Green Color 6 Gun Windows, 4 Bow Windows Gun Window Dimensions 13.75" x 8.35", 40" up from floor Bow Window Dimensions 13.75" x 23.35", 24.5" up from floor Door Dimensions 22.5" x 55.35" 72" x 84" x 78" Weigh..
A blind built for the solo hunter in mind. This blind is perfect for those hard to reach areas with its small footprint and is lightweight. Brush it in and leave it year round or haul it in for the season. Great for turkey and whitetail hunting. Lazyman Green Color 2 Gun Windows, 2 Bow Windows Gun Window Dimensions 13.75" x 8.35", 41" from floor Bow Window Dimensions 13.75" x 23.35", 27" from floor Door Dimensions 22.5" x 37.5" 50" x 50" x 50" Weight 70 lbs Note: This blin.. Built for comfort, it will easily house two people with room to spare. This model has 10 patented injection molded windows that are built for quiet and ease of use. A great, affordable option with a 360 degree view. Lazyman Green Color 10 Gun Windows Gun Window Dimensions 13.75" x 8.35", 40" up from floor Door Dimensions 22.5" x 55.35" 48" x 72" x 76" Weight 115 lbs Note: This blind is sold in store only, and is not shippable. .. 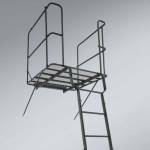 Shadow Hunter Adjustable Ladder Platform. Designed to bolt up to any elevated platform made of dimensional lumber or Shadow Hunter blind. 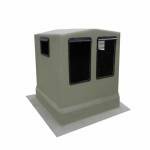 Constructed of rugged powder coated steel oval tubing. Adjustable from 5 to 10 feet Includes installation hardware 51.5" x 7.25" x 18.5" Note: This item available In-Store Only and is not shippable. .. 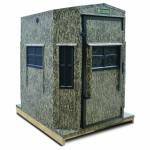 Shadow Hunter Marksman Series 4x6 Combo Blind (Pre-Assembled). A one or two person blind perfect for all types of hunting. Easily portable and fits in a standard full-size pickup truck bed. Comes standard with six 24.5" x 8" Shadow Hunter Silent Gun/Archery Windows and two corner shelves. 4' x 6' with one door. Fully insulated walls & ceilings Wood grain aluminum rust proof exterior Carpeted floor for noise reduction Commercial grade waterproof floor coating Shadow Hunter ODX camo .. 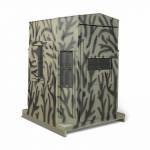 Shadow Hunter Outdoorsman Series 5x6 Octagon Combo Blind. 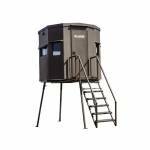 A multi-person octagon blind perfect for all kinds of hunting that allows 360 degree shooting with rotational corner windows. 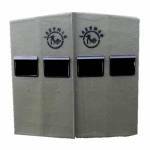 Comes standard with four 24.5" x 8" Shadow Hunter Silent Gun/Archery Rotational Windows plus four 8" x 24.5" Shadow Hunter Silent Archery Windows and one versatile 2-in-1 shelf system. 5' x 5' octagon with one door. Fully insulated walls & ceilings Wood grain aluminum rust proof exterior Shadow Hunter Sil.. This one or two-person blind is optimized for all types of hunting. 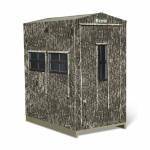 The Marksman 5×6 octagon hunting blind with its 8-sided octagon shaped design that features 360° sight and shooting range is one of Shadow Hunters most versatile blinds. FOUR over-sized 24.5″ x 14″main windows and FOUR 8″ x 24.5″ vertical corner windows optimize. Blind is also equipped with a weapon holder. 1-2 person blind 8 total shooting windows: 4 vertical archery,4 Universal Windows Total View 360 Blind Windows 32″ d..
(3) 36” Grey glass tinted windows by Deer View Window options - rifle window, bow window, or combo 2” of sealed foam insulation 12’ of padded shelving Aluminum extrusion reinforcements Carpeted floor Exterior rain shields Dual built in Air Vent for temperature control - 15 degrees cooler than the competition! Insect and rodent proof construction Custom padded gunrest included Polyurea coated inside and outside for extreme durability 8’ Stand and ladder with handrail .. The Fatgirl hunting stand is built for comfort and space, it will easily house two people with room to spare. The Fatgirl Bow Blind has 10 of our new patented injection-molded windows that are built for quiet and ease of use. The base model is painted a flat green color. Lazyman Green Color 10 Gun Windows Gun Window Dimensions 13.75" x 8.35"", 40" up from floor Door Dimensions 22.5" x 55.35" 72" x 72" x 80" Weight 130 lbs Note: This blind is sold in store only, and is not s..